Is Systematic Investment Plan (SIP) a better investment option than Lump Sum? This is an old debate and has been going on ever since SIPs were introduced in India. Most financial advisors argue in favour of SIPs and a large number of investors prefer SIPs. But some investors still prefer lump sum investment. Financial advisers and investors, who prefer SIP, argue that monthly SIPs help investors to average the cost of a unit and thereby the return is higher. Investors who prefer lump sum reject that argument on the premise that, while some units are a purchased at a lower cost in SIP, other units are purchased at a higher cost. Both arguments are true. In my opinion, comparing SIPs and lump sum investment is like comparing apples and oranges. In this article, we will try to address the debate of SIP versus lump sum investment objectively. Let us examine this with the help of an example. Mr Prasad started a monthly SIP of Rs 5000 in ICICI Prudential Focused Bluechip Equity Growth Plan on April 1, 2009. His friend, Mr Parikh invested Rs 3 lakhs lump sum in the same scheme on the same day. Till date, both of them have invested Rs 3 lakhs. Before we examine how Mr Prasad and Mr Parikh’s investments have done, let us how the fund has performed in the last 5 years. Please see the NAV chart of the ICICI Prudential Focused Bluechip Equity Growth Plan from Apr 1 2009 to Mar 31 2014. As you can see in the chart, over the five year period the NAV of the scheme has increased almost 3 times. The annualized compounded return over the 5 year period between Apr-1-2009 to Mar-31-2014 was 23.3%. However, the rise was not smooth. There were periods of choppiness especially in 2011 and also in 2013. Units bought in the choppy periods enabled Mr Prasad to improve his returns. Now let us see, how the investments of the Mr Prasad and Mr Parikh have performed. Please see the chart below, to see the returns on Mr Prasad’s monthly SIP investments over the 5 period. The SIP date has been assumed to be the first working day of each month. The blue line shows the SIP investments made by Mr Prasad and the red line shows value of his units. As on March 31 2014, the value of Mr Prasad’s investment is Rs 4.22 lakhs, while he invested only Rs 3 lakhs. The XIRR of Mr Prasad’s investment is 14%. Let us now see how Mr Parikh’s investment has done. Mr Parikh invested Rs 3 lakhs in Lump Sum in the scheme on Apr 1 2009. The NAV of Apr 1 2009 was 7.6. Mr Parikh bought 39,474 units of the scheme. Please see the chart below, to see the returns on Mr Parikh’s lump sum investments over the 5 period. The blue line shows the lump sum investment made by Mr Parikh and the red line shows value of his units. The NAV of the scheme as on Mar 31 2014 was 21.6. The value of Mr Parikh’s units is Rs 8.54 lakhs. In terms of absolute returns, Mr Parikh’s returns are almost double that of Mr Prasad’s. The reason is quite obvious. Mr. Parikh’s Rs 5 lakhs investment was invested for the entire period of 5 years. However, Mr. Prasad’s total investment was not completely invested for the entire period, since the money was getting invested in small monthly instalments of Rs 5,000. 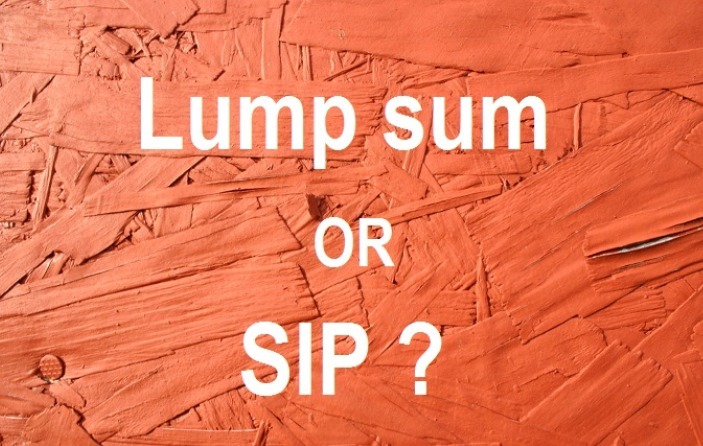 However, the comparison of SIP versus lump sum is not a like to like comparison. Such comparisons should not be the basis of deciding between lump sum and SIP investments. The option of investing in SIPs versus lump sum totally depends on the source of investment. The underlying principle of wealth creation is that, the longer you remain invested, higher are your returns. Please refer to our article, How Compound interest works, to understand this in greater details. Whether you invest in lump sum or through SIP depend on your personal financial situation. Either ways, you need to ensure that your investible funds remain invested for a sufficiently long period so that you can take advantage of the power of compounding. Investing in SIPs versus trying to time the market? For a person with invests in mutual funds from his or her regular savings, investing through SIPs makes more sense than trying to time the market and investing in Lump Sum. Let us examine this through an example. The chart below shows the returns of Mr Prasad’s Rs 5000 monthly SIP in ICICI Prudential Focused Bluechip Equity fund in 2013. Mr Prasad invested Rs 60,000 through monthly SIPs in 2013, and the value of his investment as on Dec-31-2013 is Rs 65,873. Can Mr Prasad get better returns than Rs 65,873 by trying to time the market? Let us examine. At first, Mr Prasad needs to accumulate Rs 60,000 investible funds. Since Mr Prasad relies on regular savings to make mutual fund investments, he needs to wait till he accumulates the investible corpus from his savings. Let us assume, Mr Prasad saves 50% more every month and accumulates Rs 60,000 by the beginning of September. He now has a 4 month window to put his lump sum Rs 60,000 investment to work. Please see the chart below to see the returns on Dec 31 2013, for Rs 60,000 lump sum investment, made any time between Sep 1 to Dec 31. The orange line shows the Dec 31 value of investments made on days shown on the horizontal axis. For example, the value of Rs 60,000 lump sum investment made on Sep 3 will be Rs 71,000 on Dec 31. The value of Rs 60,000 lump sum investment made on Oct 8 will be Rs 64,380 on Dec 31. The blue line shows the lump sum investment made by Mr Prasad and the red line shows the value of monthly SIPs on Dec 31 (Rs 65,873 shown in the chart above). Is it possible to beat the red line by timing the market? Let us see. From the chart above, we can that it is possible to beat SIP returns. But Mr Prasad had to make the lump sum investment before Sep 7, to make this strategy work. After Sep 7, Mr Prasad would get very few opportunities to match SIP returns. This clearly shows that timing the market is very difficult, because equity market by its very nature is unpredictable. Even investment experts with many years of experience, find it very difficult to time the markets. Therefore, in this situation it makes more sense to invest via SIPs. In fact, for long term financial objectives like retirement planning for which you need to save and invest on a regular basis, investing in equity funds through SIPs is the best option. You can refer to our article,Retirement Planning through Mutual Fund Systematic Investment Plans, to see how investing through SIPs can create wealth for retirement planning. As discussed in this article, the debate of SIP versus Lump Sum is meaningless. The decision to invest in lump sum or through SIP completely depends on your personal financial situation. If you have sufficient investible funds from a one-time income, you should invest in lump sum. A portion of your regular savings should be allocated to SIPs. Both lump sum investments and SIPs will create wealth for you, if you remain invested for a sufficiently long time.